Home ASIA SAARC: a lost cause? The long due SAARC summit is still in limbo and there is no confirmed date as to whether it will take place in 2018 or 2019. 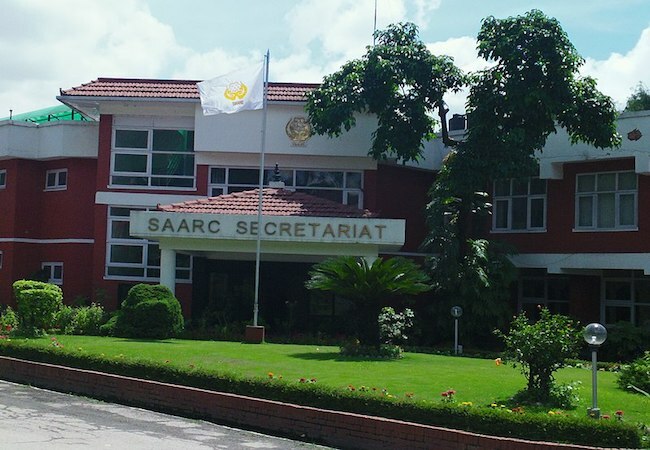 A regional arrangement initially planned to establish peace in South Asia by building a structure of interdependence among the regional states, SAARC was founded in 1985 in Dhaka, with its Secretariat in Kathmandu, Nepal. The idea was to promote development and progress, which it still stands for, mainly by resolving as well as preventing the conflicts. The goal of achieving sustainable peace and long-lasting cooperation was to be based on the understanding of each others’ insecurities and instead developing on the potentials in order to build a mutually peaceful future. Lucrative ideas for trade agreements, poverty alleviation, and reduction of arms maneuvered the motivation behind this setting. Pakistan, India, Bangladesh, Bhutan, Maldives, Sri Lanka, and Afghanistan constitute its members states with varying degree of development and progress. It is important to note that the geographical landmass covered by this organization is almost 3 percent of the global land mass, the collective population of eight countries makes up to about 21 percent of the world’s population and contributes roughly 9.12 percent of the global economy. Instead of becoming an engine of growth, the organization mainly remained ineffective in face of jarring realities confronted by the South Asian region at the political, economic, social, diplomatic, and military front. The widespread poverty rampant throughout the region, low intra-regional trade, lack of infrastructure for regional connectivity etc. continued to act as a source of divergence among the member countries. Most of all SAARC has mainly suffered due to Indo-Pakistan rivalry, political and military competition, and never ending blame game. A huge lack of trust between these two states and among the other states of the region is yet another reason which couldn’t let the SAARC countries come together on the same page. While the EU model is often looked upon as a success story having France and Germany putting off their difference and coming together for the larger benefit of the region, unfortunately same couldn’t be replicated in the South Asian region. Here the two nuclear rivals could never put their differences behind and continue to stay embroiled in the ever prevalent security dilemma. Although the SAARC charter requires for the head of the states to convene a meeting every year, this hasn’t been happening regularly. In fact this particular activity has come to a standstill since 2014 after the 18thSAARC summit. Owing to the unfortunate Uri attacks in 2016, the 19th SAARC summit scheduled to be held in Pakistan was called off by India alleging Pakistan for orchestrating the attacks. Other member states including Bhutan, Bangladesh, Afghanistan, Sri Lanka, and Maldives also boycotted the summit and have rendered the meet to be postponed for indefinite period of time. It is being hoped that the SAARC summit should be convened in the running year in Pakistan but the year has almost come to an end now without any positive response from India. The latter sticks firm to its stance of having no possibility of opening dialogues with Pakistan unless it stops ‘terrorist activities’ in India. Indian External Affairs Minister while addressing a conference in Hyderabad stated that “the Centre chose not to respond positively to Pakistan’s invitation. That invitation has already been given but we are not responding to that positively. Until and unless Pakistan stops terrorist activities in India, there will be no dialogue and we will not participate in SAARC”. This raises a pertinent question as to whether SAARC has been a lost cause and completely dysfunctional? Would it be better to dissolve it instead of disrespecting the charter owing to whatever justified reasons? If a progress can be made in case of Kartarpur corridor between India and Pakistan, why can’t same be adopted in other matters of differences. India essentially appears to be stubborn playing mostly on its whim and avoiding to open channel for dialogue. This is intentionally putting not just the bilateral relations but the whole region into turmoil. How can one expect the issue to be resolved unless there is a talk or discussion about it. Not letting the SAARC summit happen or boycotting it would definitely not achieve anything, instead will only nullify any prospects of positive development and progress for the region. This is ironic that the Kartarpur corridor could still happen despite India’s grievances with Pakistan, and while the ceremony for laying the foundation stone was underway on both sides of the border, India still doesn’t shy away from harping the same stubbornness of giving no chance to dialogues with Pakistan. On the other hand, Pakistan has been extending various invitations to Indian leadership, offering a hand of peace only to be refused every time. External Minister Sushma Suwaraj’s emphatic No to attending the SAARC summit raises serious concerns especially when other countries do want to give peace a chance. While this whole scenario represents quite a despondent state of affairs, on the other hand it is good to see that other states are willing to improve things at the regional level and want to give peace and development a chance. One good recent example in this regard is Sri Lanka, the leadership of which early this year in March held talks with the Pakistani counterpart on issues of interests and specifically expressed commitment to making SAARC fully functional. Nepal also showed willingness for its support to SAARC and expressed hopes that the SAARC summit takes place in Pakistan on time. This shows that India is the only one disrespecting the very charter and objectives of SAARC owing to its own ulterior motives. It is only adding to the already difficult situation in the region instead of discussing and addressing the problems and challenges. It is extremely important that all the member states put in their dedicated efforts to pull SAARC out of its current dire state. It is equally important for India to realize that it also stands to suffer if the regional peace is made hostage to its own self interests. India is very much part of this region much like other seven states and this reality cannot be changed. Hence, any positive step collectively taken at the regional level will benefit all and causing hindrances would only take away any such opportunity. Indeed, Pakistan is under a lot of international pressure to do more with regards to the alleged terrorist havens on its soil, but SAARC should be taken as a platform where such problems and challenges should be deliberated upon to find a way out. There is also a need to understand that Pakistan is not alone in this, it is the one country which has borne the maximum causalities in the war against terrorism. Nonetheless, SAARC should not be rendered dysfunctional owing to the political differences. It should play an effective role in creating interdependency among the member state, which could be one way to establish trust and making everyone a stakeholder. There are several potential areas of cooperation including the field of science and technology, infrastructure building, working towards regional connectivity, terrorism, poverty alleviation, tourism, university exchange programs etc. if SAARC remains hostage to the bilateral politics, it will never be able to deliver on the ideals it was established for decades ago. Proposal can also be extended to other states in a closer geographical proximity to be part of it and making it a more active as well as effective organization, free from the hegemony of just one country. Therefore, the possibility of expansion of SAARC should not be ruled out. Last but not the least, SAARC is a good platform which still holds a hope for the regional states and should not be allowed to be wasted off. The states should work together with the differences, focusing on relatively less grave socio-economic issues first.